This Saturday, August 14, 2010 at Times Square NYC a “kiss-in” will be held around a 26 foot-tall statue that was erected yesterday. For decades, everyone wondered who that sailor was. Many tried to stake the claim but only the truth came out. Click here to read the entire story. 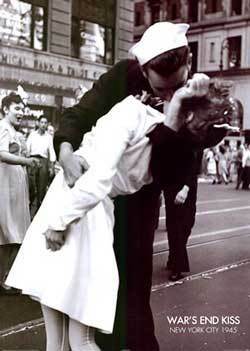 The statue was inspired by the iconic kiss (left) between a nurse and a sailor which marked the end of the war on August, 14, 1945. 65 years later you and your significant other can relive the moment. How romantic is that? Just excuse me for a second while my heart melts.